Prime Minister Binyamin Netanyahu, Likud MKs praise project encouraging small businesses in Judea-Samaria, in defiance of BDS campaign. 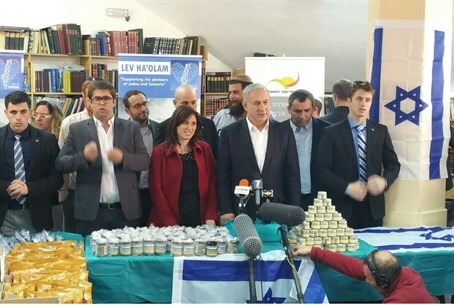 Prime Minister Benjamin Netanyahu, Likud MKs, and Judea-Samaria regional officials visited the Lev Haolam Package Project headquarters in Jerusalem Tuesday, in a show of support for the region's residents and against the Boycott, Divestment, and Sanctions (BDS) movement. The organization, which partners with the Samaria Residents' Council, exports thousands of products from small businesses over 1949 Armistice lines, the Gaza belt, the Golan Heights, and the Galilee to consumers across the globe. The project is specifically designed to thumb its nose at BDS, as well as strengthen Judea-Samaria's economy and encourage small business ownership. During the visit, Netanyahu met with employees and investors, as well as small business owners who flocked to the event to showcase their wares. The prime minister specifically requested that wine not be displayed during the event, in order to encourage leftists still harping on the "Bottlegate" scandal to shift their attention elsewhere before elections. The Prime Minister thanked and congratulated Lev HaOlam's founders for the project, which he noted stems from the international community's "systematic persecution" of Israel. "You can see it in the Human Rights Council of the United Nations: the resignation of he who headed the commission of inquiry [William Schabas - ed.] - a role that had no reason to exist in the first place - is the best evidence of the anti-Israel slant which defines the Council," Netanyahu stated. "The Council of Human Right held more discussions on Israel in 2014 than on North Korea, Iran, and Syria combined." "This council is skewed, biased; if anyone should stand for investigation there it is the Hamas terrorist organization and not our soldiers," he continued. "IDF soldiers are protecting us and we will continue to protect them by exposing lies, bias, and hypocrisy. We will fight the boycott, we will fight the lies, as we do all the time." Other MKs present at the ceremony agreed. "It is now that we see exactly where the slant is against Israel," MK Tzipi Hotovely (Likud) stated. "Against it, there is a clear answer: there is only one leader, Binyamin Netanyahu, who can lead the campaign against anti-Israel activity." "The people of Israel know that addressing trivial issues are not important, that these elections really depend on the status of Israel in the world and this is the only leader who can handle it," she added. "Israel is strong thanks to the correct leadership." "We came here to strengthen those who fight against boycotts," MK Ze'ev Elkin said. "We did this during the previous term when we led a law against boycotts, and we do it around the world for the leadership of Prime Minister Binyamin Netanyahu and up against anyone who tries to harm Israel." "They boycott - we buy, we will build," he continued. "Some organizations are leading campaigns to boycott to try to bring down the Likud government; as long as Likud is in power they cannot attack us. It does not surprise me." Elkin was referring to the V-2015 campaign, which is bankrolled by foreign NGOs and includes a delegation of campaign staff from US President Barack Obama's campaigning organization designated to ensure that anyone but Netanyahu is elected as Prime Minister for the 20th Knesset.